Why Do You Think It’s OK to Celebrate Murder? 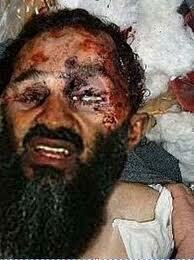 Osama is dead. But no matter what the pundits say, I just can’t get behind this. I can’t be happy that a person has died, no matter what sins they have committed, no matter what heinous things they have done. Osama Bin Laden was still a soul, and the real question, the one that matters is: where is that soul now? If you believe that Christ was telling the truth, that he is the WAY the TRUTH and THE LIGHT, that there is no way to the Father but belief in Jesus Christ, then Osama has been lost forever. Christians, or people who say they are followers of Christ, are reveling and feeling satisfaction in the one thing Jesus came to stop. Again, as a Christian man, I don’t see it as holy or Godly to lift up a man’s death. Christ brought people back to life, he didn’t kill them. How can we call ourselves His followers and still glory in this man’s demise? Would Christ condemn a man to death like this? Christ’s response was love, hope, and forgiveness in the deepest and realest ways. Turn the other cheek? Not just meant for people to overcome verbal insults. Sacrifice everything, even the things that you know are just, in order to show love. To Jesus, showing God’s love was everything. But to us, this weekend, death and “justice” are everything. Which one makes more sense? Which one feels more right? Why Do You Think It's OK to Celebrate Murder?